Neither of them has confirmed it but the internet is buzzing with rumors of an affair between the much older Sean Penn and 26-year-old Scarlett Johansson. The duo added fire to the rumor mill on Monday when paparazzi photographed them having lunch with ScarJo’s foot resting comfortably on Sean Penn’s lap. In news that’s not going to shock anyone, pop princess Christina Aguilera got herself busted for public drunkenness. The Dirrty singer was taken into custody for her own protection according the the Los Angeles County Sheriff’s office. 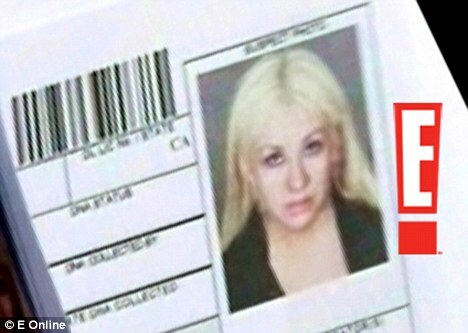 Aguilera was a passenger in a car driven by her boyfriend Matthew Rutler when the couple got pulled over by cops. Rutler was arrested for driving under the influence. Aguilera was released early Tuesday morning and will not be prosecuted. The singer filed for divorce from her husband in October last year. For years Katie Holmes has watched silently as the tabloids ripped into her life and wrote negative story after negative story about her and her family but the brunette was finally pushed over the edge by a story published in Star magazine claiming she is a drug addict. The supermarket tabloid also claimed Holmes is on the verge of splitting with her movie star hubby Tom Cruise. While the split rumors are nothing new, Holmes isn’t taking the addict story lying down. Per her instructions, her attorney filed a $50 Million defamation lawsuit again the tabloid. Star magazine on the other hand is standing by its story. Voluptuous Mad Men Actress Christina Hendricks is the new face of Dame Vivienne Westwood. The curvy actress will represent Westwood’s “Get A Life” Palladium Jewelry collection. Stunning pictures from the jewelry advertising campaign draw attention to the actress’ famous curves so it’s safe to assume her male fans won’t be looking at the necklaces or tiaras. Serena Williams was rushed to a Los Angeles hospital yesterday to undergo emergency treatment for pulmonary embolism. Her rep confirms that the tennis champ underwent emergency treatment for a hematoma she suffered as a result of treatment of a more critical situation. Williams’ tennis career is currently on hold because of ongoing issues with her foot. A bad decision in choice of outfits landed legendary soap actress Joan Collins in hospital Sunday night. Collins claims she had a “Victorian swoon” caused by the skin hugging blue dress she wore to the Vanity Fair party. The actress was released from the hospital after doctors performed tests on her and found nothing wrong. Movie studios aren’t willing to bet on Lindsay Lohan just yet so the actress is taking matters into her own hands by taking on a modeling side gig. The troubled actress agreed to do a photo shoot with photographer Terry Richardson for a book about the glamour and history of Hollywood.